Hortus Camdenensis | Gladiolus debilis Ker-Gawl. Half-hardy cormous perennial with up to 4, narrow, linear leaves, and unbranched flowering stems to 65cm long, with up to 4, small, trumpet-shaped flowers, white or pale pink, with red markings on the lower segments, differing from most of the genus in that all the petals are uniform, spreading open like ixias. [RHSD, Hortus, CECB]. 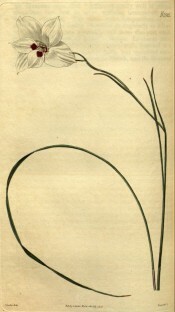 ‘This species of gladiolus appears to be an undescribed one. It is a very delicate feeble-stemmed plant. […] Communicated by the Hon. and Rev. William Herbert.’ [BM t.2585/1825]. Introduced to cultivation in Britain in the early 19th century. [JD]. Listed in the 1845, 1850 and 1857 cataogues [B.137/1845]. In Macarthur’s possession since at least 1844 as bulbs were sent to Wm. Macarthur Esq. in February of that year. [MP A2948-3]. It seems likely that the bulbs were obtained from Herbert by Bidwill during his visit to England in 1843/44. 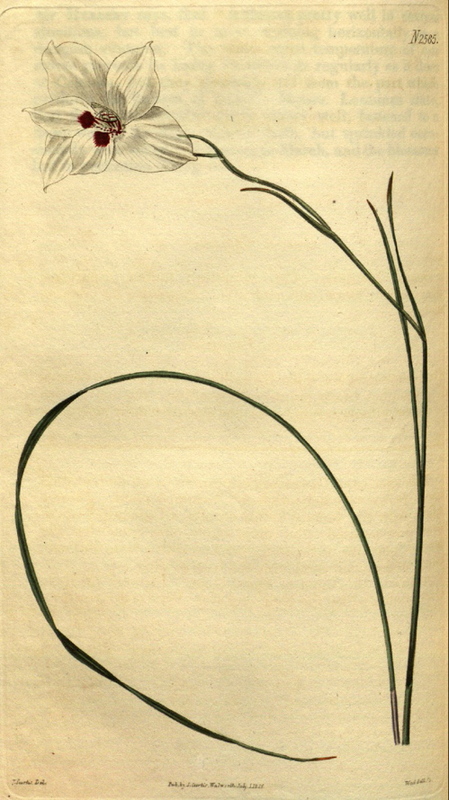 [See Gladiolus cardinalis Curt., B.132].